Penelope doesn’t like to sleep during the day and the best bet for calming her down is to walk, walk, walk. This is a child of the tropics; the hotter it is, the better. So we’ve developed a new weekday routine where I slide her into the baby carrier and go exploring Georgetown on foot. She falls asleep as long as we keep walking and while we both end up sweaty, it’s the best way for me to maintain my sanity when the two of us are alone. The other day, I decided to visit the historic Christian cemetery. There are two sections, one half Protestant and the other half Catholic. 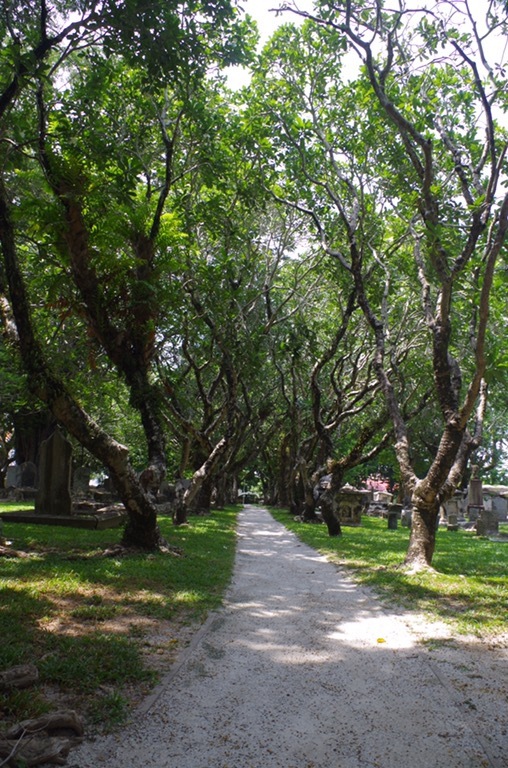 The earliest burials date to the 18th century and the last burial was in 1892. 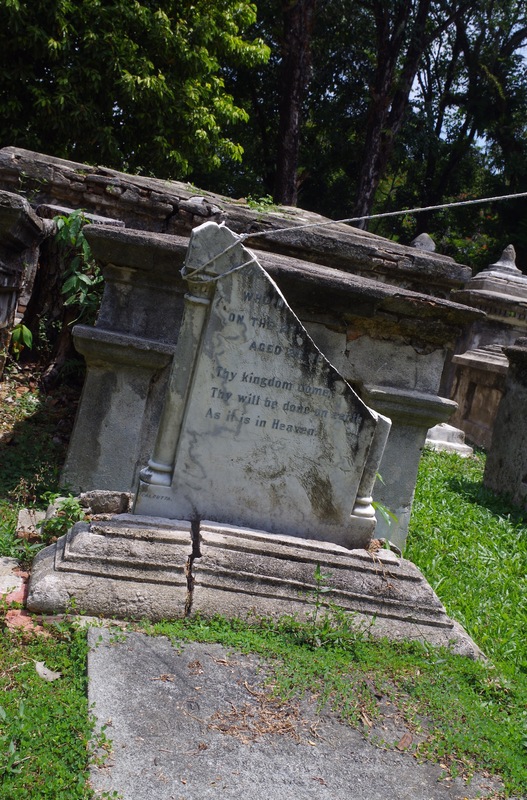 The site has suffered from neglect over the years and many tombstones are toppled, cracked, and illegible. 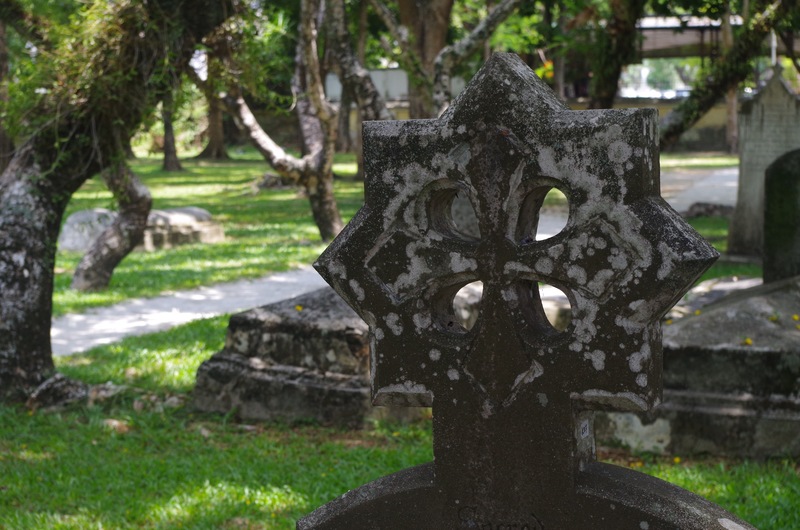 Perhaps the most extensive damage occurred during WWII, when Japanese bombs obliterated both the north and south ends of the Protestant Cemetery. 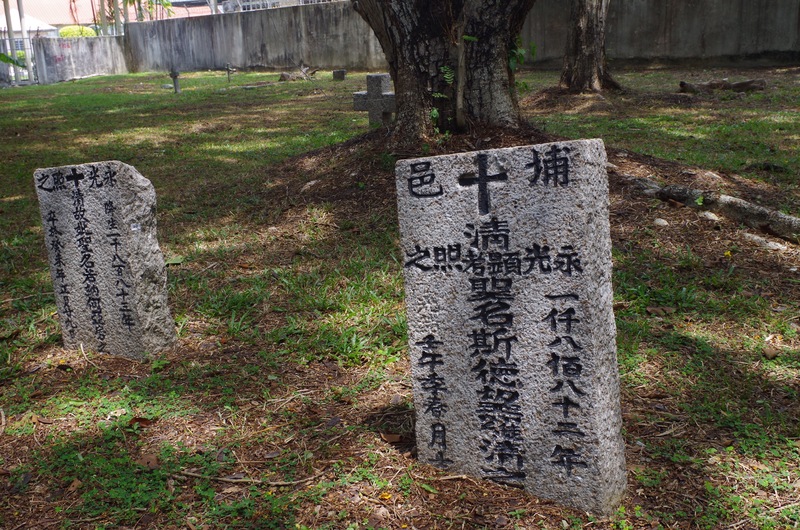 Empty space at the ends of the cemetery, which were damaged by Japanese bombs. It’s actually a beautiful place for a stroll. Tucked into a city with so little green space, it feels like a park. Plumeria trees arch over the main pathway to create a shady arbor​ and muffle the noise of the nearby traffic. I saw more species of birds here than anywhere else in Georgetown. A bright blue kingfisher perched in a tree and watched me for quite some time. 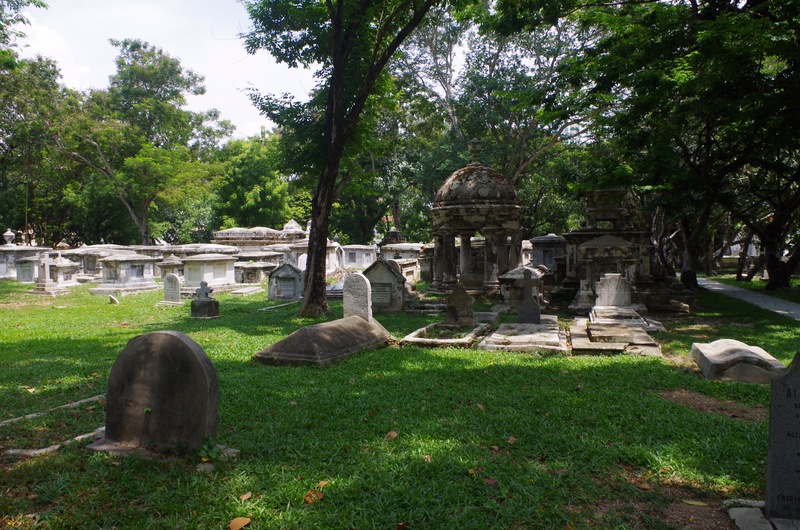 Several mynas perched on gravestones and followed behind me. It was dramatically cooler inside than out on the street, but the recent rains had contributed to the number of mosquitoes inside. Lovely place for a stroll. Many graves have been damaged by time. Anyone who knows me knows that I am interested in historic names and naming trends, so I’m always on the lookout for interesting and unusual names. Fenella. 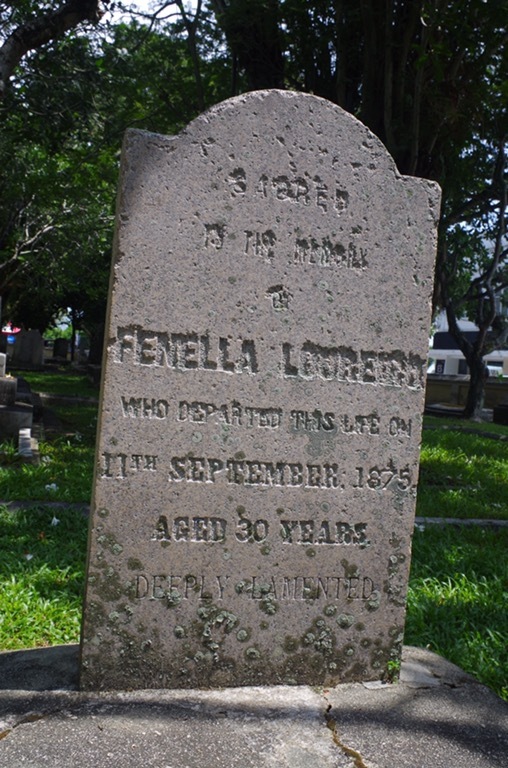 I actually know a little Fenella, but I’ve never seen the name in a cemetry before. Some of the names were a little harder to read. 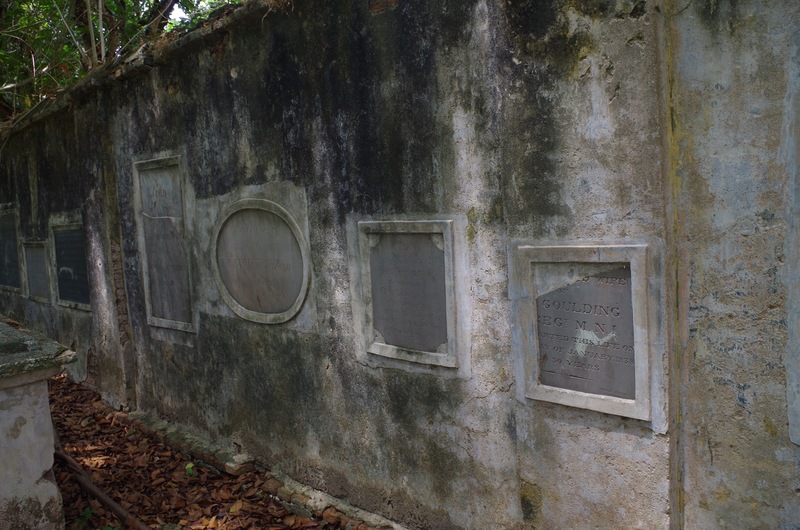 Old tombstones that had been separated from their graves were embedded in the wall between the Protestant and Catholic cemeteries. 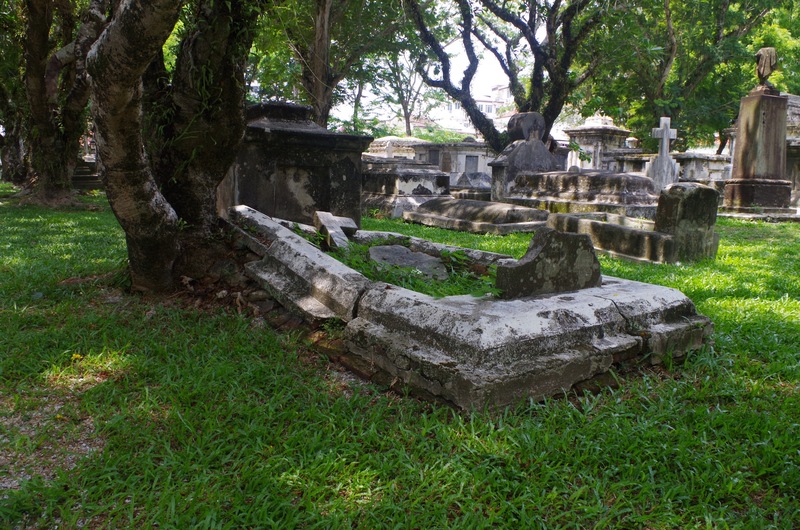 Reading old tombstones can remind us of the hardships of life in previous centuries. Of the legible stones, the majority were under the age of 50. Quite a few were young men in the 20s, and there were many children and babies as well. Especially hard to read while carrying my own baby daughter. 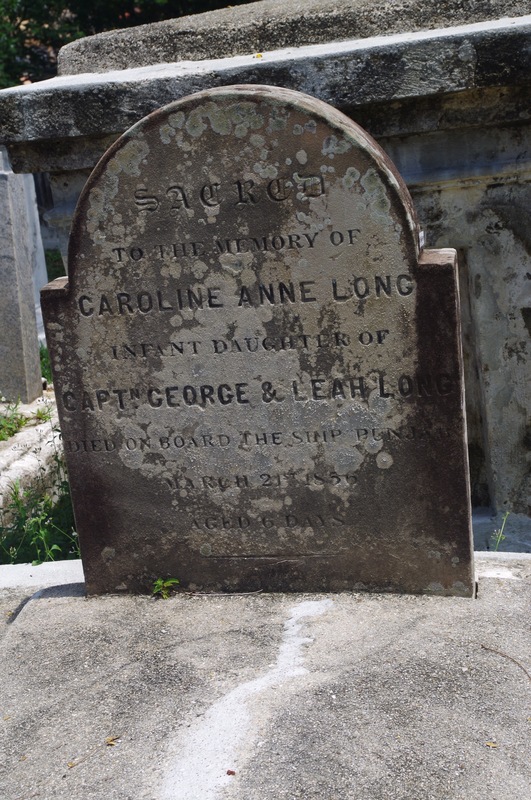 Causes of death were occasionally listed, and I saw several shipwrecks and drownings. 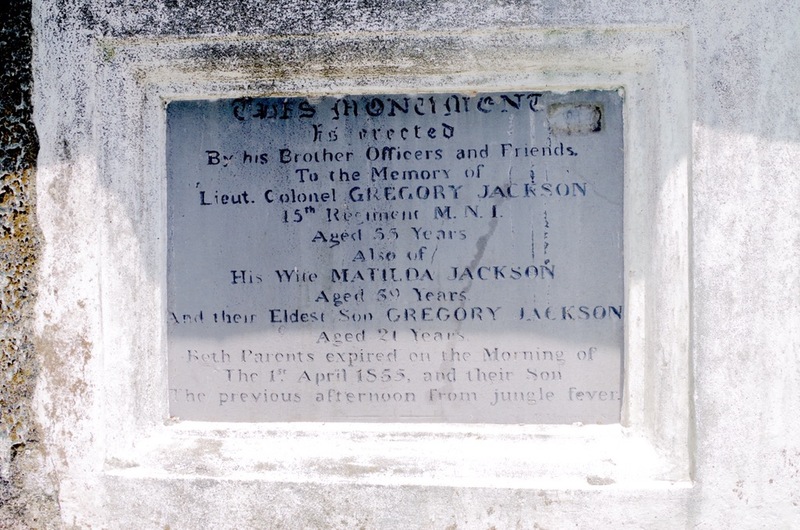 Perhaps the most unusual was the Jackson family: Lt. Col. Gregory Jackson (55), wife Matilda (59), and son Gregory (21). The previous afternoon from jungle fever. 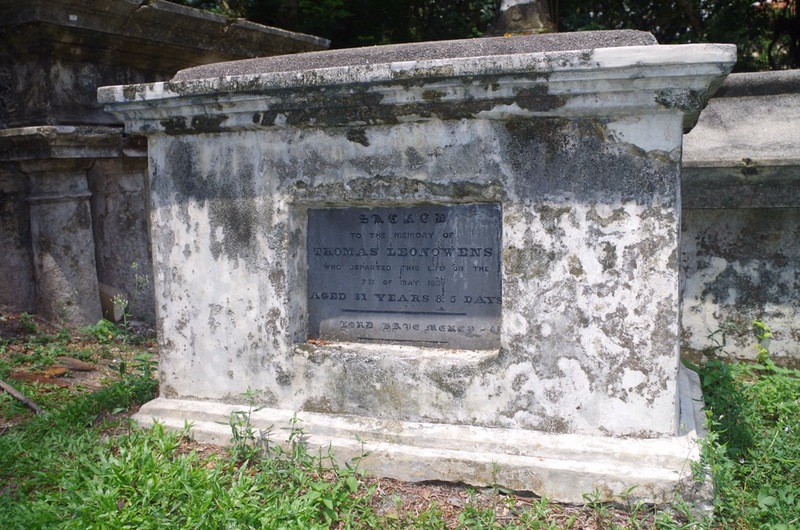 One of the notable graves belongs to Thomas Leonowens, a British civil servant. Poor Leonowens is best known for his death, for he was the husband who died and widowed Anna Leonowens, the governess of “The King and I” fame. As I strolled along, I came upon a worksite. A tarp was installed above one particular tomb and tools were strewn about. Nobody was around, but clearly work had been going on recently. I assume that the site was being used by preservationists, who were perhaps trying to restore the inscription on this gravesite. Or perhaps it’s the site of some very fastidious tomb raiders! 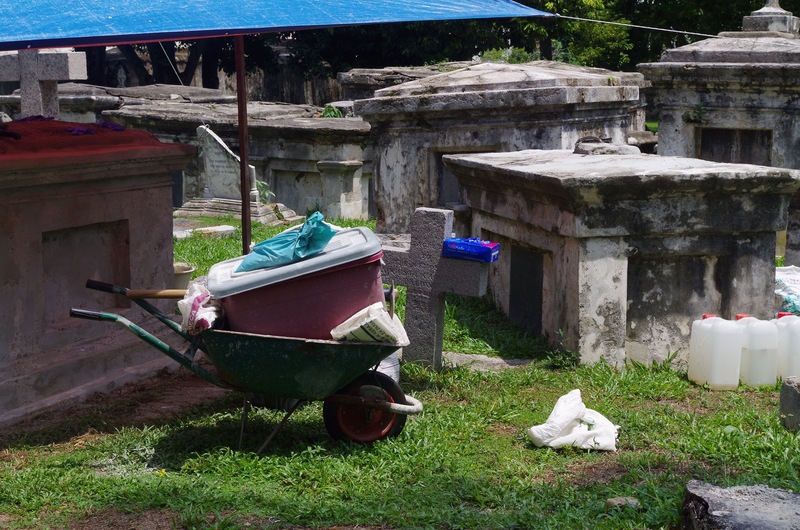 In a show of sheer practicality, the tarp was tied down on the edges of other tombstones. A box of sterile gloves was perched on the arm of a nearby cross. I guess if you spend enough time in cemeteries, you probably stop thinking of them in such sacred terms. Simon’s babysitter, Thiva, tells me that the cemetery is a popular place for Chinese couples to have their wedding photos taken. I’m not a particularly superstitious person, but I was surprised to hear that. Thank you for photos! 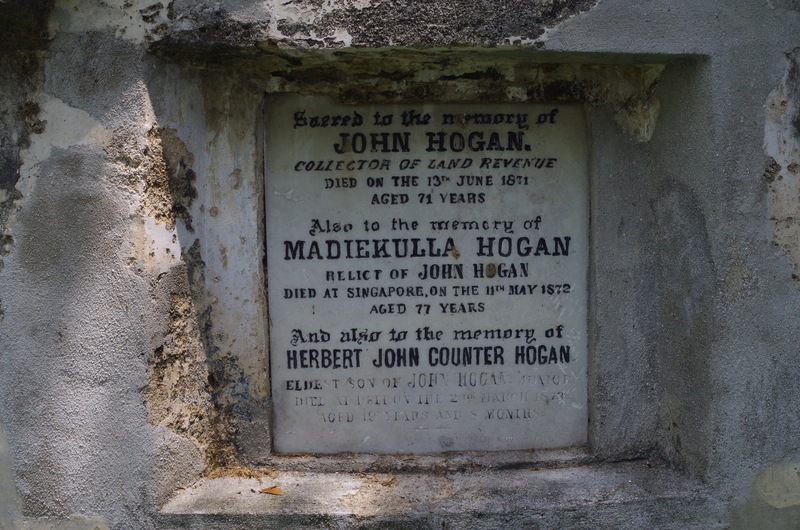 I’m tracking down great x a lot grandparents (the Hogans) who lived in Penang and have just come across the name Madiekulla this evening and on googling found your photo! Very excited. Will have to make a trip myself to Penang. I’m sorry I never saw your comment until now. I’m so glad that my picture was able to help you! Very best of luck to you and your genealogy research. Try looking on the Findagrave website. 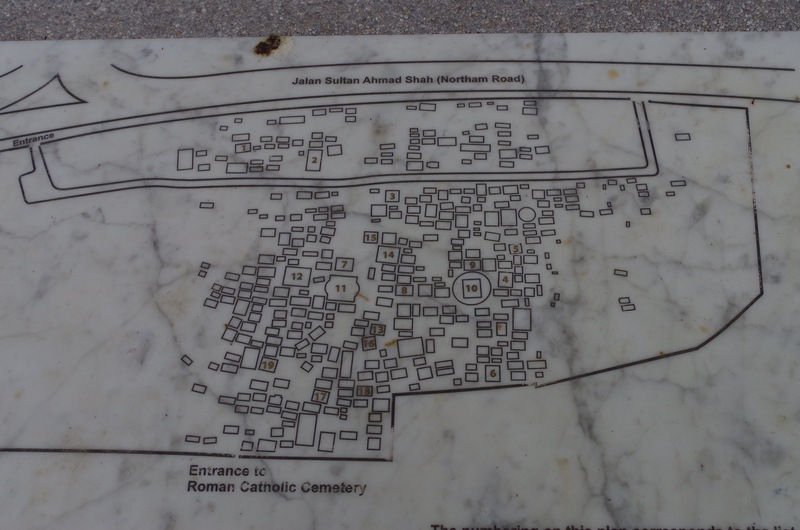 The entire cemetery is listed there. There are six Hogans buried there. There may be others in the newer Western Road Cemetery, but that’s a huge cemetery that hasn’t been fully documented on Findagrave.